Acropolis (Ακρόπολις, akro+polis) literally means edge or point of the city. Throughout the centuries the Acropolis of Athens has embodied a much more significant position not just in relation to the city, but in relation to the entire western civilization. The Acropolis was always a sacred place for ancient Athenians going back to Mycenaean times-circa 1300 BCE. They worshiped their gods in temples there, conducted their festivals, and they fortified themselves on it whenever the enemies managed to reach the city of Athens. The temples of the Acropolis of Athens were destroyed or burned on several occasions in ancient times, and the monuments as we see them today were the result of a terrific public project the Athenians undertook during “The Golden Age of Perikles” around 450 BC. The whole project was supervised by the famous sculptor and Perikles’ personal friend, Phedias. It was designed as a monument to everything that the Athenian thought pattern represented and which placed man in its center of interest. The Acropolis embodies the ideals which forged western thought and culture–Democracy, logic, rational thinking, scientific thought, philosophy, the worth of the individual, etc.–in artistic expression of the highest degree. The Parthenon itself managed to push the aesthetic conventions of its time to their logical conclusion: a building that touched the ideal in every detail. The aesthetics of the architectural elements of the Parthenon are breathtaking even in a ruinous state and strive for balance and perfection in size and proportion. The Doric columns are imposing and full of life in the way that they bow in the middle as if they are overburdened by the weight of the roof. They all appear perfectly aligned and yet closer observation reveals a controlled anarchy that compensates for the optical effects of light and the nature of the human eye to be fooled by its refraction. The proportions of the structure are well calculated and executed in a way that the temple never looks overly compensated in the measurements of one dimension or another. The fact that there are no straight lines on the building is another well calculated mirage that the ancient architects (Iktinos and Kallikrates) have executed to perfection. There have been countless books that have analyzed the Parthenon over the centuries, and scholars are still studying the structure and trying to decipher its secrets. Standing in front of the Parthenon try if you can to imagine it in all its splendor in antiquity. Try to see it as if you were an ancient Athenian. Once immersed in the role of an ancient Athenian, you will swell with pride that your culture was able to achieve such degree of aesthetic perfection and material precision. As an ancient Athenian you probably cherish your cultural achievements in Philosophy, Politics, Science, History, Economy, and Logic all embodied in the splendor of Art. You know that you, the simple citizen had a huge part in these achievements, and that your legacy will last for eons. People will come from far and wide just to glimpse all of humanity’s achievements built into stone. It is not easy to sustain such illusion with all the tourists mingling busily around the rocks, waiting patiently for their place in the photo with the Parthenon. But their very presence from all corners of the earth is the silent witness to your ancient Athenian’s successful ambitions. The Parthenon emanates a silent dignity as it stands on the rugged rock; naked of its ornaments, and deprived of a religion to represent. It is but a shell of a structure, and a shell of significance that grew with time to represent all the ancient things that survived to our day. The entire Acropolis complex stands in its ruins as a material representation for all that we have inherited and how it has enriched us–Philosophy, Democracy, Science, History, Logic, and Art–Art not for the king, or god, or deity; but Art for the individual humanity, with man in its center. The concept of the “individual” we take for granted today in the western world, was born around these rocks. The Parthenon would not be as beautiful if it were intact today. Man and weather have scared it for centuries, and their mark has taken its toll on its ancient body. But they have also enriched it with the sweet aesthetics that only time can bestow on an object. The marks of the ancient mason’s chisel are still visible on the stones today. The shifting of the earth on the misaligned column segments, the violent defacing of the statues, all tell a story more compelling than the individual parts themselves. The Acropolis was in use during the Neolithic period (3000-2800 BCE) when stone-age people took advantage of the rock’s numerous caves, its easily defensible position, and of course the Klepsydra spring. Later, in the Bronze Age (circa 1400 BCE), the Mycenaeans developed several small towns around the area. The top of the Acropolis was fortified with cyclopean walls to enclose the king’s palace. The Mycenaean Anax presided over the land from the fortified Acropolis that was the center of commercial activity. During this time the small towns around the Acropolis were united into an administrative entity that eventually grew to become the city of Athens. The sudden collapse of the Mycenaean centers throughout Greece in 1200 BCE left Athens as the only surviving stronghold in the country. But society had changed, and monarchy was abolished. Subsequently, the city was ruled by Aristocrats and Tyrants. The administrative and commercial activities moved to the area we know as Agora below the rock, and the Acropolis rock became a place of worship. By the end of the 7th century BCE the Acropolis was adorned with a large temple dedicated to goddess Athena. We have no archaeological evidence of this first temple’s layout, but we know it was adorned lavishly because we have the monumental sculptures from its pediment. A second temple dedicated to Athena was built where the Parthenon stands today, and a larger incline ramp facilitated access to the top via the Propylaea. These buildings were built of local limestone while the roof was made with marble. The temples were lavishly colored and decorated with statues of mythological origin. The 6th century BCE saw a flurry of developments in Athens that eventually led to the splendid developments of the classical era. Early in this century, Solon created laws that minimized friction among Athenian tribes and classes of people. Later, Peisistratos’ rule coincided with major economic growth and shrinking of aristocratic influence. During his reign,a the Acropolis became a major hub of religious activity with several buildings and a plethora of Kouros and Kore statues being erected there. You can see many of these statues today at the Acropolis museum. Toward the end of the 6th century, Kleisthenis’ far-reaching reforms paved the way for a Democratic society for the first time in human history. The 5th century BCE is considered to be the Golden Era of the Greek civilization, and the monuments dedicated on the Acropolis attest to a remarkable economic, political, and cultural growth. This is the Classical era. The Temple of Athena Nike was built in 499 BCE to commemorate Athenian victory over the Boiotea and Chalkis. In 490, and after defeating the Persian invasion at Marathon, citizens of Athens built another temple dedicated to the Athena Pallas or Parthenos (virgin). This is known as the first “Parthenon”, and only survived through the building of its foundations. The Persians destroyed it it, and all the other monuments of the Acropolis during their second invasion of Greece in 480 BCE. This Persian invasion was also short-lived. It ground to a halt when the Greeks defeated their navy in Salamis, and their land army in the battle of Platea a year later. Following the Persian wars, Athens became a leading city-state and presided over a broad alliance of Greek states, the Delian league. Its growth during this period was meteoric, and most of the monuments that we see today at the Acropolis were built in that period. A flurry of construction gave rise to the The Propylaea, the Erechtheion, and many other buildings around the Acropolis and Attica at large. These included the Hephaisteion in the Agora, and the temple of Poseidon in Sounio. The classical Parthenon was built during this time, over the foundation of the earlier building whose foundations are still visible today. Its construction was overseen by the sculptor Phedias who also created the ivory/gold statue that sat in its cella (the main room). The subsequent Hellenistic Era (323-146 BCE), saw a few minor buildings and structures added to the Acropolis. Most visible today is the Pedestal of Agripas before the Propylaea. Later, the Romans added a small circular temple, the Odeion of Herodus Atticus, and the zig-zag staircase that we use to this day for the ascent to the Propylaea. In 267 CE, an invasion by the Heruli tribes destroyed the entire city of Athens. The devastation was so thorough that it took the city 400 years to recover. By this time, a new religion dominated in the Mediterranean and the Parthenon along with the Erectheion were converted into Christian churches. In 1205 the Franks occupied Athens and turned the Acropolis into their fortified palace, and converted the Parthenon into a Catholic cathedral. Yet, 200 years later, the Ottomans invaded Greece. In 1456 they turned the Parthenon into a mosque, and the Erechtheion into a harem. During their occupation, the original Acropolis buildings suffered further destruction, and the Propylaea was damaged either by a shell or lightning. On September 26, 1687, The Parthenon took a direct mortar hit from the Venetians who were besieging the Acropolis. The Turks had used the temple for gunpowder storage, so the damage was extensive. The Venetian commander, Morosini, damaged the Parthenon further when he tried to remove the statues of the west pediment. The Turks re-occupied the Acropolis a year later, and turned its top into a small city. Many small homes were built around the monuments and a small mosque was built inside the ruins of the Parthenon. In 1801, the Turks gave permission to the British Lord Elgin to remove anything he desired from the Acropolis. He proceeded to loot a great amount of art, most of it from the Parthenon. His spoils, also know as the “Elgin marbles”, can be seen today in the British Museum. The Acropolis was a contested stronghold during the 1821 Greek war of independence, so it suffered more damage as Greeks and Turks alternated occupation. But after the Ottomans were finally overthrown, the newly formed Greek government set protections for the Acropolis to prevent further damage or plundering. Since then, continuous excavations and restorations have shaped the Acropolis to the existing world heritage site we see today. 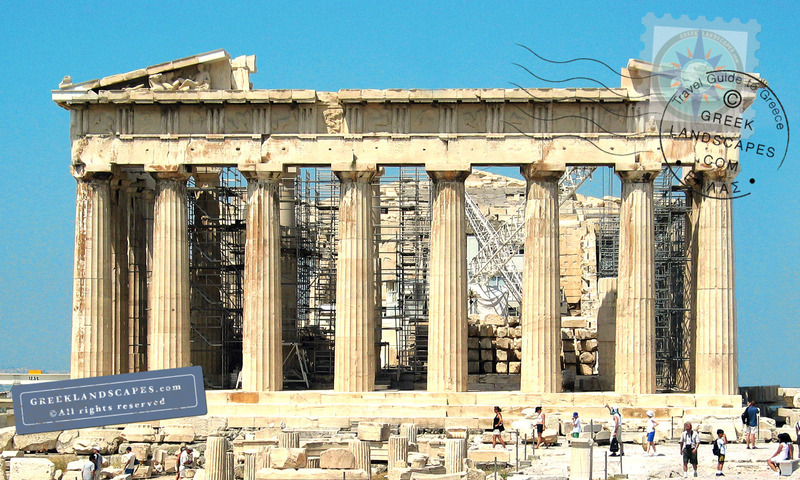 Despite good intentions, the Acropolis suffered even more damage during botched restorations, while air pollution has become a continuous threat to the monuments. This is one of the main reasons the majority of statues are now sheltered in the nearby Acropolis Museum. After validating your ticket at the entrance you have to walk up a zig-zag entryway that is very crowded, steep, and slippery. This zigzag ascent is a Roman addition to the Acropolis. The Ancient Greeks used a straight inclining ramp. As you walk up toward the propylaea, to your left you will notice the pedestal of Agrippa monument, and to your right the small temple of Athena Nike which was built during the Peloponnesian war years. The Acropolis of Athens is an archaeological site perched atop a rugged rock in the center of Ancient Athens, and it’s the most visited monument in Greece today. Expect to be among large crowds under the hot sun. Once you pass through the imposing Doric columns of the Propylaea–the same ones the ancient people passed through–you will be free to roam around atop the acropolis. The ground is relatively level, but not necessarily easy to move around since it is either too rough or too slippery in areas. You will exit the Acropolis through the same gate (the Propylaea) where you entered, so walking in a big circle to your right as you enter the plateau would be the most efficient way of touring the rock. At the northeast end there is an elevated platform where you can get an elevated view of the Parthenon and superb views of Athens all around. During the summer months the Acropolis suffers from too much heat and too many visitors. Just about every tourist will visit the Acropolis at least once during their holiday, so the sanctuary sees a lot more traffic than any other archaeological site in Greece. If you can avoid visiting during the summer months you will have a much more pleasant experience. The best time to visit is before 9:00 am, and even then in the summer you might find yourself in the midst of large crowds of people. The crowds swell to uncomfortable levels and after 10:00 am you will also be exposed to the intense summer heat that rises sharply after mid-morning. An afternoon visit is also a good idea, but remember that the guards begin herding the visitors toward the exit about a half hour before the site closes, so get there at least 90 minutes before closing time, and plan on spending at least 45min to examine the monuments comfortably. You will need sturdy shoes, a hat, sunglasses, sunscreen, and two bottles of water (or one large one). If you are sensitive to the sun you might contemplate bringing along a parasol, as there is not much shade of note anywhere on the site, and the summer sun is very intense after mid-morning. Buy your water bottles before you reach the ticket counter since the two vending machines (the only place to buy bottled water at the Acropolis) are often out of order or empty, and when they work, the lines are long. You will have to check large bags and coats at the little building near the entrance, to the left of the ticket counter. A water fountain, and toilets can be found in the vicinity of the ticket kiosks at the entrance, and once you reach the top of the hill at the farther (east) end of the Parthenon. There is a post office kiosk, and a museum shop next to the ticket counter at the south end of the rock. Tickets are sold at the two gates to the Acropolis. If you reach the site via metro, the ticket kiosk is across from the Acropolis Museum. If you walk to the Acropolis from Monastiraki or Thesion metro stations, you will find the ticket booth at the end of your walk right next to the gift shop. The ticket is valid for entry in: Ancient Agora, South slope of the Acropolis (Theater of Dionysos), North slope of the Acropolis, Roman Agora, Kerameikos, Temple of Olympian Zeus, and Hadrian’s Library. You may choose to visit these sites at different days with the same ticket, but if you are in a hurry the tour can be done in one busy day. The approach to the Acropolis is possible from two different gates at the foot of the rock where ticket kiosks provide entry. Three different train stations surround the Acropolis: Thesion, Monastiraki, and Acropolis. The Acropolis station is right outside the new Acropolis museum and the closest to the ticket booth for the archaeological site. Once you get your ticket, you can move through the south slope of the rock, past the Theater of Dionysos and towards the Propylaea. The ascent is through gentle slopping footpaths. One entrance is on the south end, and can be used by those who ascend on foot from Monastiraki or Thisio train stations. The walk from Monastiraki is the steepest, while the one from Thisio is a much easier. Once you get your ticket you can move straight up towards the Propylaea (the actual entrance to the top of the Acropolis rock). Alternately, you can walk the perimeter towards the Theater of Dionysos. If you take the latter route, you will have to return the same way to reach the Propylaea again. In both cases, the hike to the Propylaea is fairly steep but the main path is paved with cement and not difficult to walk through. Accessibility for persons in need is available through a lift. 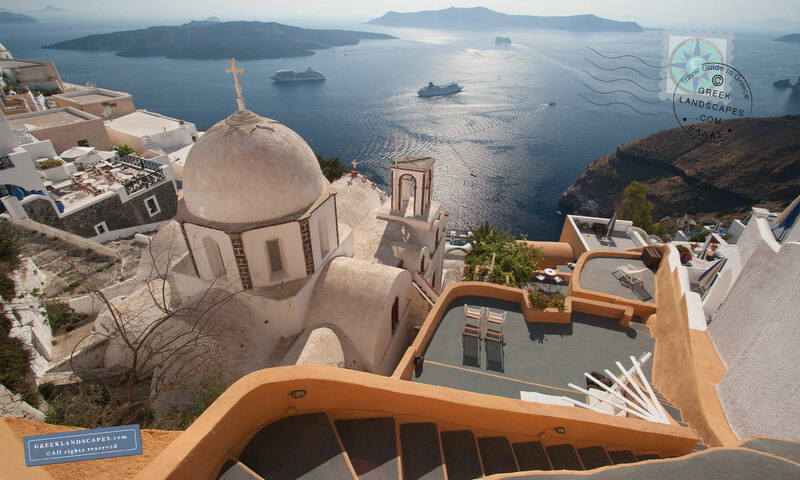 If you need handicap accessibility through the elevator, you should call 210 3214172-3 (prefix the country code for Greece: 30) for information and to find out if the lift is operational before you arrive. 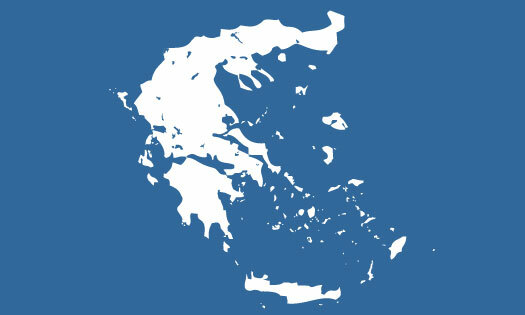 Click here to see the Acropolis on the map and to get directions. Click to open the aerial view of the Acropolis in a new window.